What's thrilling and relaxing and totally cool? Tubing on the Farmington River in central Connecticut! When hot and steamy summer days arrive in the Hartford area, the best way to cool down is to head to Satan's Kingdom State Recreation Area, located at 92 Main Street (Route 44) in New Hartford, Connecticut. While a place named Satan's Kingdom doesn't sound like it'd be cool, Farmington River Tubing has operated from this riverside outpost for years, and anyone who's driven along Route 44 between New Hartford and Canton in the summertime has likely seen Farmington River Tubing's brightly colored tubes dotting the river. Free and ample parking, changing houses and restrooms are available at Satan's Kingdom. When you're ready to go tubing, wait in line to sign waiver papers and rent your tube and life jacket. For 2018, prices are $20 per person on both weekdays and weekends. Tube a second time on the same day for an additional $10. Be prepared to pay with cash (credit cards and checks are not accepted). Then, get ready for a memorable river ride. The 2.5-mile tubing course is more calm than wild, but you will encounter three sets of rapids that will get your heart racing. Keep your feet up, and hold on tight to the handles. The second set of rapids is the most likely to toss you off your tube, so lifeguards are stationed there. The rest of the river is unattended, and for much of your ride, you'll drift along lazily, enjoying the sounds and cooling sensation of rushing water and the warmth of the sun. Sunscreen with a high SPF is a must. Tubing the Farmington River isn't for everyone. For starters, it is highly recommended that participants be at least 10 years old and 4 feet tall, and they must way at least 50 pounds. The maximum recommended weight is 300 pounds. Everyone who rents a tube must know how to swim. No… dogs can't tube. Pregnant women can't, either. And if you are under the influence of drugs or alcohol, you should not (and won't be permitted to) venture out. Read these rules before you make a trip. The current can be strong in places, especially after a big rainstorm and in the early part of the season. The water is quite cold, and once you start your ride, there's no turning back. Farmington River Tubing operates daily from Memorial Day weekend through mid-September. Call ahead, 860-693-6465, to check river conditions and hours of operation before you make the drive to New Hartford. Weekday operation in the early and late part of the season may be spotty due to weather or staffing issues. Wear something on your feet. An old pair of Keds is ideal, but water shoes or strap-on sandals work, too. Don't wear flip-flops or any other footwear that you might lose easily. Wear an old T-shirt over your bathing suit. Farmington River Tubing actually suggests a long-sleeve T-shirt to help prevent your arms from chafing as you hang onto your tube, but on most summer days, you'll probably be too hot in long sleeves, and in the unlikely event you wind up having to swim, you want to be as unencumbered as possible. Don't wear sunglasses, a hat, jewelry or anything else that you wouldn't want to lose. Don't forget to apply sunscreen liberally. Use the restrooms before you set out. While the time of your ride can vary based on the current, you're looking at about two hours stuck in a tube, and you may have to wait a bit, wet and cold, at the other end for the Farmington River Tubing blue school buses to pick you up. Don't be tempted to snooze in your tube when the current slows. Stay alert. Watch for a tube suspended from a tree. It's the "exit" sign, and you won't want to miss it. 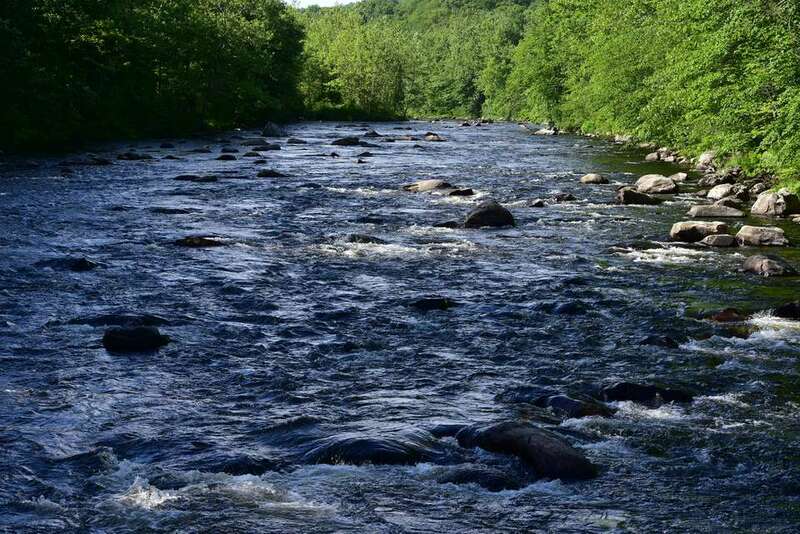 Need a Hotel Near Farmington River Tubing? The Residence Inn Hartford Avon in Avon, Connecticut, is the closest hotel to the launch site. Rodeway Inn & Suites is a more affordable option 15 miles away in Torrington, Connecticut.